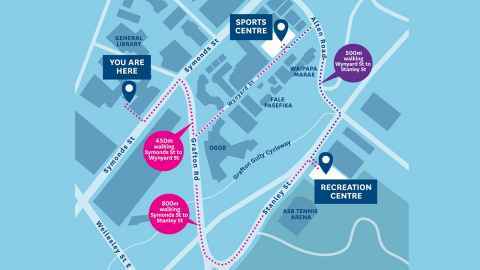 Take a look at what the University of Auckland's Recreation Centre has to offer. We have a diverse range of cardiovascular (cardio) equipment available in a number of our fitness studios. This will help you to improve your fitness, burn calories and to develop muscular endurance. The sports hall features a fully sprung 32m x 24m wooden floor, which is slightly larger than two three-quarter size basketball courts. You can hire a range of sports equipment from Reception. How to book the Sports Hall. Our weights room is well-equipped for all levels of training; from lightweight to powerlifting, there is a large selection of resistance machines as well as dumbbell training and bench-pressing areas. We offer a wide range of Group Fitness classes run in the studio to cater to all different fitness needs. When not in use, members can use the studio space for their own workouts, with no need to book. This studio is used for dance and other classes, practice, martial arts training, meetings and by University clubs. Register for a Dance programme. Equipped with 50 bikes in a dedicated area, the Spin Studio is used for Group Fitness classes and is available for members during certain times. The bouldering wall is currently available up to two metres only. No top roping or lead climbing is permitted. The Core and Stretch area doubles as a TRX suspension space, with foam mats and rollers, medicine balls and power bags. The circuit includes both resistance and aerobic training equipment, and is designed to work the entire body, focusing on the major muscle groups. An optional buzzer sounds each minute, at which time every circuit user must move to the next machine. This means you never have to wait for a machine. The court on level one can be booked by members at the Reception counter on level 3 (Symonds Street level). The court can also be used casually, though member bookings take priority. The Women’s Space is located on level 1 of the Recreation Centre and includes a range of cardio and weights equipment, plus stretching space in a more private environment. Take a break and play some table tennis! The Recreation Centre has a dedicated area set up for table tennis on level 4 (Quad entrance). Anyone can use this area on a casual basis: members and non-members alike. There is also a small stereo and a dart board available in this space. Balls and bats are available for hire at the Reception desk on level 3.